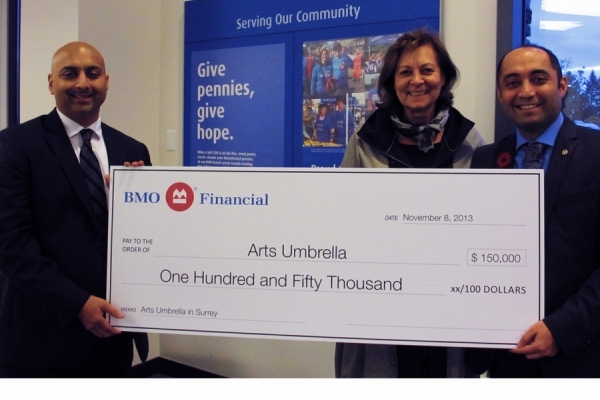 BMO Financial Group has donated $150,000 to support Arts Umbrella programming in Surrey. This donation will make it possible for children and youth, aged two-19, to access high quality art-education programs that encourage them to collaborate on their projects, develop innovative thinking skills, creativity and greater self-confidence. Children will have the opportunity to access early learning, visual arts, theatre and music, and media arts tuition-based and outreach programming at the Arts Umbrella South Surrey and Surrey Centre locations, as well as at the several partnering schools in which Arts Umbrella offers after school programming in the Surrey community. This 3-year gift will ensure that Arts Umbrella can offer children in Surrey the long-lasting benefits of a high-quality arts education. Thank you BMO Financial Group for supporting Arts Umbrella!